The PATA European Junior Cup, powered by Honda is excited to announce a new initiative in association with DWO and the FIM Europe. The Women’s European Cup will run as an integral part of the PATA European Junior Cup and will compete with identical race prepared Honda CBR 650F motorcycles at all 8 European rounds of the eni FIM Superbike World Championship. 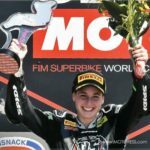 Female riders will be eligible to score points in both EJC and the Women’s Cup, with the highest point scoring female being appointed as the 2015 FIM Europe Women’s European Cup winner. The prize for the overall winner is a new Honda CBR 600 RR, prepared to European Superstock 600 specification. The ‘Women’s European Cup’ is open to female racers aged between 14 and 23 years. The upper age limit for the PATA European Junior Cup male riders is now set at 21 years. This in line with the recent changes made to age limits for the FIM Europe Superstock 600 European Championship and FIM Superstock 1000 Cup. All other terms and conditions are as per PATA the European Junior Cup. The entry for the 2015 Women’s European Cup is priced at Euro 22,950.00* and includes ownership of the race prepared motorcycle and its road equipment (with a specification value of over Euro 10,000),Supersport tyres according to the series schedule, fuel, oils, brake pads, motorcycle transportation, storage, workstations, plus coaching and technical support. The Grand Prize for the 2014 women’s Cup winner will be a latest model Honda CBR 600 RR prepared to FIM Europe Superstock 600 specification. The PATA European Junior Cup, powered by Honda is excited to announce a new initiative in association with DWO and the FIM Europe. The Women’s European Cup will run as an integral part of the PATA European Junior Cup and will compete with identical race prepared Honda CBR 650F motorcycles at all 8 European rounds of the eni FIM Superbike World Championship.